U.S. retail sales of medium-duty trucks in October remained strong amid broad-based demand, pushing past 18,000 units, according to WardsAuto.com. Sales hit 18,566, a 14.1% increase compared with 16,267 a year earlier, according to Ward’s. Year-to-date, sales rose 6.3% to 183,757. Classes 4-5 sales jumped the most, 21.1%, to 8,032 — following the trend for August and September. Two brands, respectively, again dominated these segments. Ford Motor Co. sold 4,220 Class 5 trucks, good for 64% of the market, or 6,581 total sales. Ram Trucks, part of Fiat Chrysler Automobiles, was next with 1,382. In Class 4, Isuzu Commercial Truck of America Inc. earned a 52% share on sales of 751 trucks out of 1,451 total. Class 7 sales climbed 10.3% to 5,567. 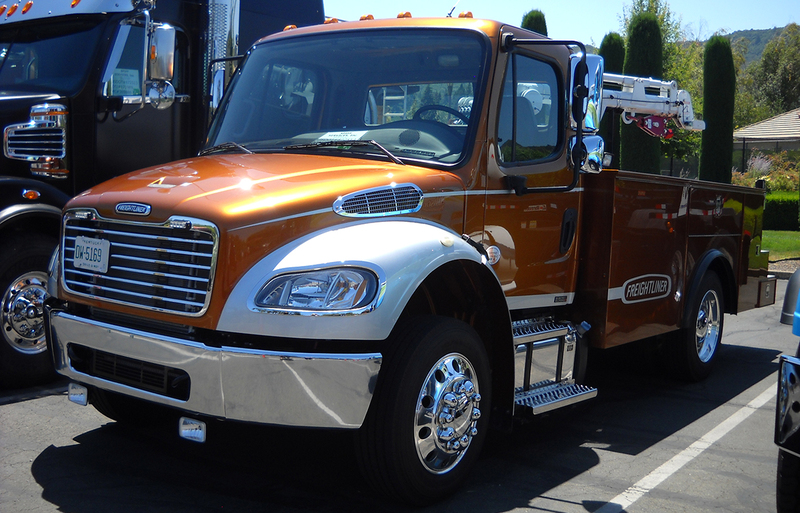 Freightliner, a unit of Daimler Trucks North America, led with 2,425. Next was International, a unit of Navistar International Corp., with 1,618. Paccar Inc.’s two brands, Peterbilt Motors Co. and Kenworth Truck Co., respectively, sold 662 and 388 Class 7 trucks — good for a combined 1,050. Ford and Hino Trucks USA sold 246 and 228 Class 7 trucks, respectively. Super-competitive Class 6 totaled 4,967, up 8.2% compared with the 2016 period. Freightliner led with 1,645. Ford Motor Co. sold 1,326, and International 1,223. Looking long term, one nationwide truck dealer said the next decade will see increasing electrification of lighter medium-duty segments but only form a niche market. Our continued ability to stock bodied-up medium-duty trucks allows us to meet our customers’ immediate needs. W.M. "Rusty" Rush, chairman and CEO of Rush Enterprises Inc.
“I think [electrification] is down in your smaller classes, 4 and 5. Maybe some [Class] 6 stuff down the road as they perfect it,” W.M. “Rusty” Rush, chairman and CEO of Rush Enterprises Inc., said in a third-quarter conference call with stock analysts. “Maybe in 10 years [electrification in medium-duty] is a 15% player, or something like that,” Rush said, adding advances in finding and drilling for domestic crude will flatten out the cost of crude and keep diesel popular. Rush’s Classes 4-7 sales increased 14.5% from the 2016 period, accounting for 4.6% of the total U.S. market. “Our continued ability to stock bodied-up medium-duty trucks allows us to meet our customers’ immediate needs,” he said, noting the sales reflected continued strength in a wide variety of industries nationwide. Rush operates more than 100 heavy- and medium-duty truck dealership locations in 21 states. ACT Research Co. forecasts total Classes 4-7 sales to reach 238,475 units in 2017, a 5.4% increase over 2016, Rush said.